Thanks for showing interest in joining my private studio! I’m very excited to accompany you and help you achieve your musical goals. After Scheduling a time, I will arrive at the student’s house and begin teaching following warm-up and tuning (if needed). .The lesson will last 30 mins to an hour. It is encouraged for the student to warm-up before hand and have all materials ready before the lesson. This ensures the lesson goes smoothly and no time is wasted. Although it is good to have privacy between the teacher and the student, parents are always allowed to sit in on lessons if they wish. After each lesson I will communicate what was done during the lesson, as well as the work he/she is expected to complete before the next lesson. Each lesson is used to teach and address any questions or concerns of the student. Students are always encouraged to have fun! The student must have his/her own instrument (drums, piano, or guitar). Every student is asked to keep a folder in order to keep all materials organized. Lesson books are a requirement and are to be purchased prior to the second/third lesson. Guitar students are required to have a pick, tuner, capo, and guitar case as well. If the student can’t make the lesson due to an illness or family emergency I must be notified 24 hours in advance or by 9:00 AM the morning of the lesson. Any forgotten lessons, or cancellations after 9:00 AM the day of the lesson will still be charged. If I am ill, or cannot make the lesson for an emergency you will be notified promptly and will not be charged for the lesson. If able, I may reschedule lessons that were missed due to illness. Payment will be collected the first week of every month. The first payment will start after the first lesson and will be pro-rated. I will accept cash or check, but no credit or debt cards. Half-hour rates are $35, and full-hour rates are $60. Thank you for choosing me as your instructor, and I’m looking forward to starting this musical journey together! Please feel free to communicate any questions or concerns. Caleb Hoffman is a private Music Instructor based out of Charlotte, NC. He was accepted into the University of North Carolina School of the Arts when he was 15, where he studied percussion performance for 4 years under John R Beck, a world renowned percussionist. Caleb has been studying drums, guitar, and piano from a very young age. Once he started teaching lessons privately in his freshman year of college, he fell in love with it. The moment he saw his student’s eyes light up in an “ah ha!” moment, he knew teaching was his passion. 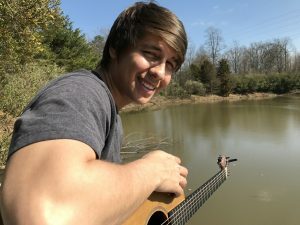 Caleb has taught at schools such as Carmel Christian School, Porter Ridge Middle and Porter Ridge High School, Onstage School of Performing Arts, and Lanti Music. The benefit of being in Caleb’s private studio is never having to leave your house. All you have to do is be ready for the lesson when he arrives! Caleb has been performing since he was 10 years old. Throughout middle school, he performed percussion in the school wind ensemble. He auditioned and made all-district, all-county, and all-state band throughout the duration of middle school. After his freshman year he was accepted into North Carolina School of the Arts, where he frequently collaborated and performed in many different ensembles. His senior year he won a songwriting competition called Winston-Salem Shuffle. His freshman year he was the principal percussionist in the musical, OKLAHOMA! which was conducted by Hollywood Bowl conductor John Mauceri. Caleb’s freshman year he applied and was accepted into the University of Michigan for percussion performance. He went on to help form the band Salem Lake where he performed many times throughout the east coast and won the Gorrilla Music Battle of The Bands. He has collaborated with Lil’ Chuckie, of Lil’s Waynes record label YMCMB along with J Stylz from Blackstreet. Beyond performance, Caleb has produced, written, and recorded his own LP album. He also aspires to be an audio engineer and spends much of his time learning in front of Pro Tools honing his skills. Caleb’s Teaching philosophy is based on honesty and freedom of expression. He wants every student to feel completely comfortable expressing their feelings, strengths, and struggles with learning. Earning the trust of the student is one of the most important jobs to Caleb, because it allows the student to be completely honest with the teacher. He pays attention to different learning styles and customizes the lesson to best fit each student. He believes straying from the traditional high-pressure style of teaching can produce a more natural and rapid growth. Performance is a big part of being a music student, and he strongly urges each student to create and perform with other growing musicians. Practicing should not feel like homework, but a tool for growth, stress relief, and expression. Caleb finds that teaching beginners from books such as Faber’s can be helpful in making the beginning process fun and stress free. These books take fundamental musical concepts and apply them in a way that is easy to understand. Call or email to schedule your private music lesson today!